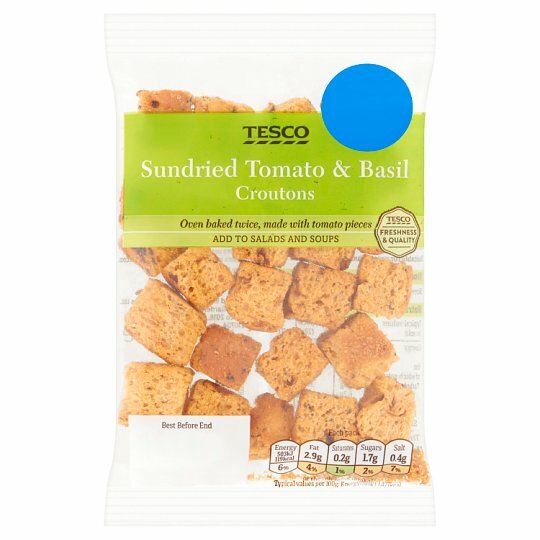 Oven baked croutons made with tomatoes and basil. Oven baked twice, made with tomato pieces. Add to salads and soups. Wheat Flour (Wheat Flour, Calcium Carbonate, Iron, Niacin, Thiamin), Rapeseed Oil, Sundried Tomatoes (5%), Sugar, Yeast, Garlic Purée, Sea Salt, Olive Oil, Basil, White Wine Vinegar, Salt, Rosemary, Black Pepper, Garlic Powder. For allergens, including cereals containing gluten, see ingredients in bold. Also, may contain milk.